A-2 Flight Jackets Cockpit USA There are 5 products. 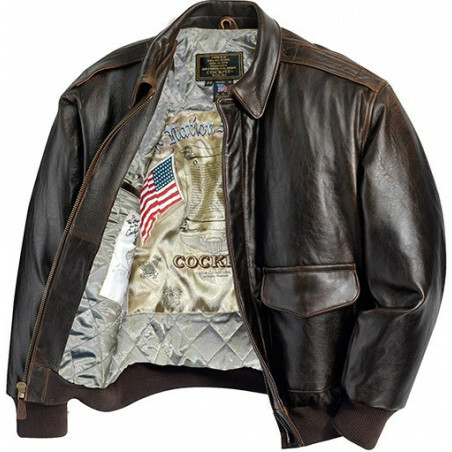 The world-famous American brand Cockpit USA offers you the updated versions of the A-2 Flight Jackets. The legendary jackets have a long history. Wearing the jacket you will feel as if you come back to 80s, 90s and more. The new features include hand warming pockets, interior pockets, a hidden inside pen pocket and underneath flap pockets. The jackets retain all the authentic charms of the original and cater to modern conveniences. These flight jackets are perfect to every day wear. Most jackets have regular fit, available in different colors. Browse also a great selection of Cockpit USA G-1 Bomber Jackets, Cockpit USA B-3 & Sheepskin Jackets, Cockpit USA Bomber Jackets, Cockpit USA Motorcycle Jackets, Cockpit USA Field Jackets & Cockpit USA Coats. Shop for impressive Men’s Jackets & legendary Women’s Clothing. Get the best jackets at the clothingmonster.com today!